A. not feel like I had to rush through everything. B. be able to meet with the groups I was actually planning to meet with. C. finally be able to fit in a brain break. D. not always feel like we were playing catch up. STEAL BACK THE MINUTES! I want to show you ways that you can get those ten minutes back, without breaking the laws of time or even extending the bounds of your literacy block. 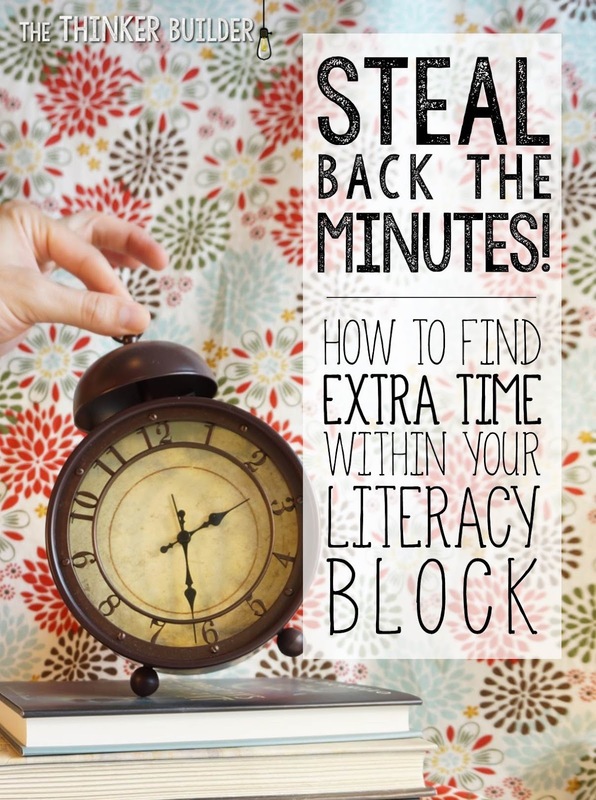 Yep, that's right, I'm going to show you how you can gain time within the literacy block you currently have. We're going to be sneaky. We're going to be clever. We're going to be bold. But let's be clear: none of these ideas will replace the time-conserving power of strong classroom management. And this is not a post strictly about classroom management. We are simply stealing minutes here, people. Now let the theft begin! Significant time can be lost to students gathering the materials needed for whatever is next. Consider making the needed materials visual. 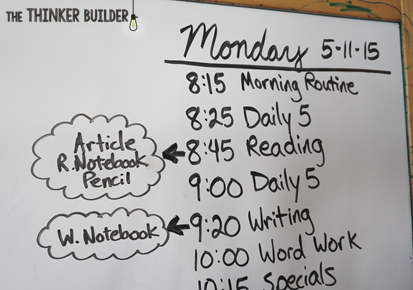 For example, if you keep a daily schedule, you could add a list of materials over to the side of the subject. Consider having an "Always Bring" list that students learn to be the standard, even without you saying so. 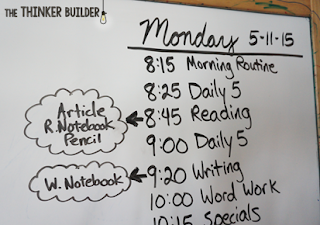 For example, when I gather students at our meeting area for any shared reading lessons, it's expected that students bring a pencil and their reader's notebook, unless I say not to. We don't always use the standard materials... no big deal. We have it ready if it's needed. Consider designating a place on the board to post a page number. Rather than repeating the page to the class five times, tell one student the page number, who proceeds to record it on the board in the known place. Consider building accountability within table groups. Instead of me being the one making sure everyone has what they need, we practice taking care of each other in this way. Consider the order of your actual words. Consider the difference between these two sets of directions: "Please go back to your desk and get out your reading anthology, notebook, and pencil." (Immediately after the word 'desk,' half the class begins moving, and only half of that half hears the word 'notebook.') OR, "Class, I'm about to tell you what you need next. There are three things. Count them off on your fingers as I say them to you: reading anthology, notebook, pencil. Ready? You may go." Some might say the fewer the transitions from one setting to another, the more minutes saved. On the surface, yes, that seems logical. But we should keep in mind the ability of young minds (heck, old ones too) to concentrate and focus for only short periods of time, say... 10 to 15 minute stretches. I think we'll more than make up the time lost from an efficient transition or short brain break by having fresh brains. Consider short, less-than-one-minute brain breaks to re-energize students' minds. Brain breaks don't need to involve a lot of hoop-la. The key is getting into one quickly, and getting out of it quickly. Consider using a transition to read aloud a few pages from a novel. Consider moving students' location, even if it's not necessary for the activity/lesson, in order to help students refocus (which saves time in the long run). I know there are times when I could keep students at their desk for one activity after another after another, but instead I will ask students to meet me at our meeting area on the floor for something, just to give them a change of pace. Consider techniques to keep a transition efficient. Counting backwards aloud from fifteen is one I often use. Okay, these are getting hard to quantify, I know. I'm just ballparking it here. We're getting into some heavy hitters now. Your whole group instruction time surely has some minutes waiting to be stolen back, particularly with mini-lessons. For goodness sake, let's keep them mini. (I'm talking to myself here too.) Oh, but how? 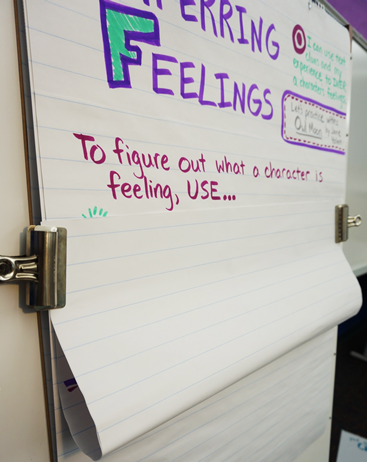 Consider pre-filling portions of an anchor chart that will be used during your lesson. When I have the time, I like to write the chart title, the learning target, and the basic framework of what will be on the chart, and then flip up the bottom and hold it up with a binder clip. It saves time during the lesson, and as an added bonus, it gives a little intrigue and anticipation to what we'll be doing. Consider shooting for a 9-minute mini-lesson. Sure, 10 would seem to make more sense... it's a nice round number and all, but "9" is a single digit. It sounds WAY shorter than"10," don't you think? Just like $19.95 sounds so much cheaper than $20.00. A shorter lesson is going to require us to really get to the heart of the skill in a clear and direct way, and not try to do too much in one sitting. Consider using student friendly learning targets. In my experience, not only do they get students to "share the responsibility" of learning, but it helps me focus my instruction on what really matters. Consider a "Hook and Go" view to your mini-lesson, where you succinctly hook your students and then dig right into the teaching. My favorite types of hooks are to begin with an applicable personal story or to simply connect to a previous lesson that students have mastered. Consider allowing students to move from the "listening" phase to the "practice" phase earlier, particularly when moving from a writing mini-lesson to the application of that lesson. After a nine-minute crack at a mini-lesson, instead of rambling on or fielding off-topic comments, try this: "Boys and girls, if you feel like you are ready to try this out in your writing, I want you to go back to your desk and do just that. If you are not ready yet, stay here, and I will help you get started." Within twenty seconds, I'm left with exactly the students I need to be left with, ready to guide them further. Whether you use a Daily 5 framework, a workshop model, a rotation with centers, or something else, if you meet with small groups and/or individuals, then I'm sure you feel spread thin at times. Consider keeping all necessary materials at the small group table, including the texts to be used, sticky-notes, and pencils. Lots of extra pencils. If I had a nickel for every time I waited to start a reading group because half the group went back to their desk to get a pencil, well, you know. Consider starting one small group, sending them off to read and/or practice a strategy, and meeting with another group in the meantime. Then check back in with the first group afterward, or at the beginning of the next small group session. I wouldn't do this all the time, but in some situations, it can save time. Consider being a "mobile" guided reading teacher. When you camp out at the small group table, minutes can be lost transitioning from one group to the next. Members from the next group will be spread about the room, some of them actually deeply focused on what they are doing, and when they are called back to the table, it takes some time. Instead, ask the group you will meet with second to sit in a certain area on the floor. They can still continue to work on whatever independent work they would normally do, but now those students are already gathered in one spot. Now when you finish working with the first group, YOU get up and scoot over to the waiting group and get started. Consider having multiple groups meet simultaneously around the room, while you move around and pop in with each group that is meeting. This takes quite a bit of training in order for students to be productive even when you are with other groups, but with certain types of meetings, like debating a text-based question, it can be both a powerful and an efficient use of time. Consider holding one-to-one writing conferences during your writing workshop at the student's desk, rather than calling them back to a certain spot in the room. Again, time is saved during transitions because you are almost always a quicker transitioner than your students. But more importantly, conferring at the student's desk has the "spillover effect," where the peers sitting nearby pick up tips and strategies too. When I say "double dip," I mean not always isolating each component of your literacy block. When you teach a nonfiction text structure during social studies, you are double-dipping. Or when you teach technical writing strategies during science, you are double-dipping. You can double dip just within your literacy time as well. Consider tying in vocabulary instruction during reading lessons. Consider tying in grammar and spelling instruction during writing lessons. Consider the "real-life" connections to a double-dipping mentality. We don't isolate different skill sets from each other. We pull the skills that we need, when we need them. We don't lie on our couch reading and say, "Oh, I can't look up the meaning of that word right now because it's not time for vocabulary work." It's time to see how we did! Let's see... 1+2+5+3... carry the one... +2... that's at least 13 minutes we stole! Okay, granted, the number of variables involved makes it impossible to really know how much time we are saving, but it's safe to say we are on our way to a more streamlined use of time. Lets' rise up together, my readers. And let's get those minutes back!